napa valley through michele’s eyes! thank you to katie hintz-zambrano, michelle drewes and the whole team at refinery 29 for the fun day! Michele in one of her signature J.Crew button-ups and Ksubi cut-off shorts out in the vineyard. It’s hard to think of a cooler life than that of St. Helena resident Michele Ouellet. 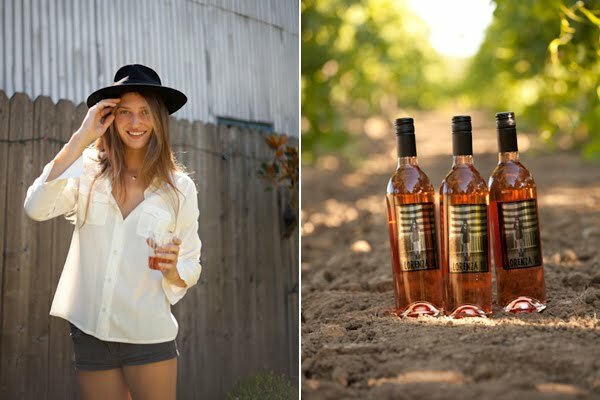 The 23-year-old stunner not only circles the globe modeling, but when she’s back home in Napa Valley, the super-down-to-earth gal is out in the vines, playing vintner at Lorenza Rosé, the wine company Ouellet and her mother own. To find out what a Day in the Bay with Ouellet looks like, we caught up with the local lady and had her play tour-guide around her St. Helena home and ‘hood. Naturally, a little dress-up ensued, as well. Take a look at the gorgeous results below, and get ready to schedule a trip up north, pronto. Tell us a little bit about your job and why you love it. You and your mother are involved in an organization to help promote women in wine. Tell us about it. Michele kicks back in her stand-by, in-the-vineyard Frye boots. How much are you involved in the wine-making? 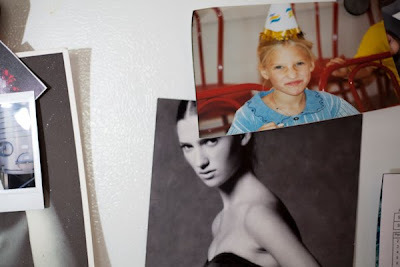 A picture of Michele as a child and one of her modeling shots hang on the fridge. Michele in her backyard in an Equipment shirt, a vintage hat scored in Paris, ballet flats from the Flats shop in St. Helena, shorts stolen from one of her best friends, holding a glass of Lorenza Rosé. You’re on the front of your own wine bottle! How would you describe the product? You’re constantly on the road. Can you share any packing tips? What are three pieces you find yourself wearing constantly? What’s the most treasured piece of clothing in your closet? You’ve worn all kind of designer brands. Who are your favorite designers and why? Michele and her brother pause for a family picture. What trends are you digging right now? What’s in your closet that you’ve never worn? What do you love most about your Napa Valley-St. Helena ‘hood? What would you miss most if you left the Bay Area? Michele at two of her top St. Helena haunts, Ana’s Cantina (left) and Sogni di Dolci coffee shop (right), wearing her mother’s vintage YSL shirt, cut-offs, and shoes from Flats. What are you top five favorite spots in Napa? What’s a secret store you love that you’re willing to let our readers in on? Checking out the long-lasting “tip-top” quality shoes at Flats in St. Helena. Ballet flats, Vans, and Prada pumps…a pretty good summary of Michele’s overall style. What are your favorite spots to visit abroad and what is the coolest hotel you’ve stayed in? What’s up next for you: In both wine and modeling?